JARVIS ingests campaign data in real-time enabling Advertisers to self-serve their advertising on a Publishers page with the Top-Up functionality. JARVIS provides the full scope of a digital campaign in real-time, including delivery, CTR and spend, allowing for more informed decisions on optimisation. JARVIS Events dashboard consolidates real-time performance metrics for each creative placed in a game, including Share of Voice, Ad Placement and Total Duration. 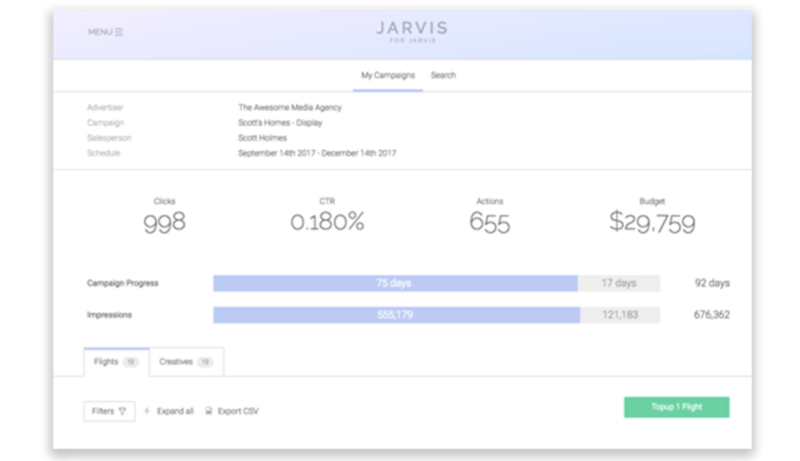 JARVIS ingests Out-of-Home campaign data in real-time enabling Advertisers to have access to their campaign performance metrics when they need it most. Get ready to self-serve advertising your way.